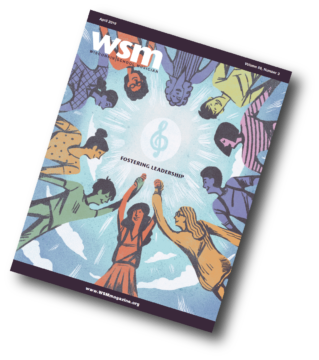 I had the wonderful opportunity to interview three young music directors in the Northwoods of Wisconsin: Brett Hulmer at Ashland High School, Nathaniel Miller at Drummond Schools and Zachary Olson at Washburn Schools. They are at the beginning of their careers; second year, third year, and sixth year respectively and I have been impressed with what I have seen in their students. I hope new directors find encouragement from my questions and their answers. I hope veteran directors find connections to their programs. Please explain your current teaching situation (School, size, classes you teach). BRETT: Ashland High School, roughly 670 students, and I teach wind ensemble (30 Students), jazz band (20 Students), concert band (45 Students), and music theory (5 Students). NATHANIEL: I teach band and choir in a very small rural school. Our school has fewer than 450 students from preK-12th grade and I do all of the musical ensembles. My classes are fifth grade band, sixth grade band, fifth and sixth grade choir, middle school band, middle school choir, middle school jazz band, high school band, high school choir, high school jazz band, and high school swing choir. ZACHARY: I teach at Washburn School District in Washburn, WI. I direct the sixth grade choir, the middle school choir, the high school concert choir, the middle school show choir “Illumination,” and the high school show choir “Fire & Ice,” in addition to teaching semester-long classes in Beginning Piano and Beginning Guitar. I will occasionally teach independent studies on a case by case basis. Compare your first year of teaching with where you are in your career now. BRETT: My first year of teaching was last year, and was a chaotic mess. The students accepted the change of teacher well, but did not know what they were in for, nor did I. I was very comfortable connecting with all of my students and maintaining good relationships with them. Teaching all of my classes were the easiest, and most enjoyable parts of my days. The chaos came from learning how my school runs their systems. The added chaos came from a major change in administration. We gained a new principal and a new vice principal, both in their first years of administration. Our superintendent and our athletic director announced they were leaving for different schools, and many teachers were also on their way out the door. Learning their new systems was difficult because all of the teachers were now in the same boat. How to put requisitions in is one thing, but remembering what all of the different codes apply to, is a whole new level. Understanding the proper forms to get district vehicle use. Learning what labor work I am expected to do versus what our maintenance department is willing to do. Learning how to negotiate a definitive extra duty contract. And the other “simple” teacher things like lesson planning, grading scales and communicating with parents. They don’t teach you any of this in college, mainly because every school district does it differently. Year two is unbelievably easier than year one. There is a gained respect alone from the students and other faculty of “you came back!” Now that I understand the systems of the school I can actually implement systems of my own such as an individual lesson schedule, designated areas for instruments and music, Google Classroom, etc. I am actually able to leave the school at a decent hour rather than eating a quick dinner in my office. I am gaining a higher authority in the classroom, and the senior attitudes are very seriously beginning to level. Other teachers in the building have learned the way I work, and do approach me for input, and I can actually respond with worthwhile answers. NATHANIEL: I’m in year three at the same school that I started in, but my situation here has changed a fair amount. Initially, the music department was two full-time teachers; I taught all of the band classes and the older elementary general music classes while the other teacher taught all of the choir classes and the younger elementary general music classes. The department is now myself as full time and another part-time teacher, with me doing all of the band and choir and him doing all of the general music. When I initially got here, the fifth and sixth grade bands were combined (first and second year players), which was really difficult from a teaching perspective. I was able to get the numbers up high enough to justify splitting that class into separate groups, which helps a lot. I’m feeling a lot more confident in my decisions and actions now than I was initially. I still second guess myself, but the constant fear of “oh no, I’m doing this wrong and I’m going to ruin these students!” has faded a lot. I also, knock on wood, have gotten a much better handle on the flow of how things go in this school. I know what to expect at different times of year and am not surprised by things nearly as often. ZACHARY: I have a lot more confidence in my abilities now, and I am starting to feel like it’s becoming more and more of MY program, rather than something that I’ve inherited. Students have finally stopped asking me if I’m going to leave at the end of every school year, which I see as a plus! What brought you into teaching music and what has kept you in it? BRETT: What music has allowed me to experience is something that I wanted to share with everybody I possibly could. I just remember being in high school thinking about what I wanted to do for my future, and never actually having a direction. I loved sports, and at that time, was determined to be a college athlete. I got hit with the slapstick of reality when I learned this really isn’t the lifestyle I enjoyed. That world is all about competition, and there is really not enough beauty in it for me. Knowing I will have talented students looking for this same direction is a fulfilling thing for me. I can lead them. Knowing I will have students who wouldn’t normally be able to afford traveling, but I can take on a band trip. Allowing kids to have experiences using music is what keeps me in it. NATHANIEL: I have loved making music since I started playing the saxophone as a little second grader who convinced his parents to let him get lessons years before he was old enough to start band in school. In general, middle school was a really unhappy place for me. The only part of my school day during those few years where I was happy to be in school was band. When I got towards the end of high school and started thinking about what was next, I realized that there was nothing I could do that would be more important than being for someone else of what Mrs. Jampole was for me (hi, Emma, if you happen to be reading this newsletter). It’s easy to get frustrated as a music teacher, especially with my class load and groups only rehearsing 1-3 times per week depending on the group, but I am still here because of the kids. I still can’t imagine anything else I could do with my life that would matter more than helping kids, and music is the way in which I’m able to do that. ZACHARY: I think my high school music teachers had a huge influence on bringing me into teaching music and not some other subject. They always inspired me to do my best and aim high, and I strive to do the same with my students today. I’m in it to see as many students succeed at vocal music as I can, as it gives me great satisfaction to see them “get it” and put on an outstanding performance. We currently have a shortage of music teachers and we have had young teachers leave before their fifth year. What can you say to someone who is going to be a music teacher that will help keep them in the profession? BRETT: Two things: 1. Pace yourself. There’s going to be things you want changed immediately, but those are also unattainable right away. Find a way to balance the current, versus the needs, versus the wants. Most of my colleagues that quit the profession early explain that they are burnt out, or haven’t seen enough progress in their program in five years. They also know they can make more money doing less work in a different job. Most of the time, that progress isn’t supported by the district because it wasn’t communicated well enough. This leads me to number 2. Advocate, advocate, advocate. Learn how to use your words to effectively show the importance of what you’re doing and WHY you’re changing something. Advocate to your fellow teachers, administration and especially your students. They want to know why you’re changing something, not just be told what to do. NATHANIEL: I don’t always excel in creating a healthy work-life balance for myself, but in looking at teachers I know who have stuck it out for the long run, that seems to be key. The people who are able to leave work at work, not get themselves too worked up about trumpet players who just can’t remember that B natural needs 2nd valve, and maintain both musical and non-musical hobbies outside of their teaching selves are the ones who last longer and seem happier. At the end of the day, I shouldn’t be sitting at home getting frustrated about a kid who won’t play B natural because I can guarantee that the kid isn’t sitting at home being frustrated about it. ZACHARY: The early years might be rough, and you’ll probably make a mistake or two. Learn from them so you do even better next time. Hopefully you have a team, or even just another music teacher, in your corner who can help pick you up and point you in the right direction at first. Don’t be afraid to ask questions about anything you need to learn to be successful at the job. What is different in your teaching from when you were a student? BRETT: When I was a student I never understood the importance of why I need music in my life. Now I feel like I spend most of my time teaching what a world without music would be, and how, in order to keep music in the world, it starts in the classroom. Also, I currently connect a lot with my students just by being young enough to know what’s hip. I do what they do, I play video games, I listen to some of the same music, and I see the funny memes, which always helps. When I was a student, I didn’t have teachers who connected like that. NATHANIEL: This is a difficult one for me to answer because the context of where I came from is so different from where I am now. I was a student in a wealthy Chicago suburb with a very large, well-funded music program. Compared to where I am now, in a very small school with a high percentage of students on free and reduced lunch and the closest private lesson teacher (other than me) 35 miles away, the difference is night and day. I can’t really say what differences are due to it being 2018 versus when I was a child and what changes are due to the geography, population density, socio-economic status, culture, etc. ZACHARY: I notice a lot more emphasis on technology in the classroom than when I was a student. Kids can record their voice parts on their phones, we use YouTube to watch awesome choirs and show choirs, and the kids can practice music theory and sight singing from the comfort of their own home IN ADDITION to what we do in the classroom! When used correctly by teachers and responsibly by students, technology doesn’t have to be the enemy. What is the vision you have for your music program or what do you want to try with your students in this era of learning? BRETT: Moving forward I’m looking to gain numbers; I want to add extra bands. Hopefully a second jazz band, and a third performing ensemble. I hope to have enough students to ask the school board to create an assistant high school band director position-dreaming big I know. I’m looking for my program to produce many serious players over the years, who will always find enjoyment in their playing. In the current era of learning I’m trying many different ways to get my kids to benefit from the older and better players as a whole. Having the younger students learn a class A concert band piece with the older students so they understand where they are expected to be at my high school music program is a big step in this process. I experimented with requiring all of my students to learn a solo/ensemble piece. This became my third quarter chamber music unit, and many of my kids failed forward from it. Looking into this upcoming third quarter they’re already asking about when they can start practicing for this. I want my students to be able to listen to music and understand it beyond the regular student who isn’t in a music class, the implemented music theory class is a big help in this. Most importantly I want my program to produce the overall best students in the school. I want all of my students who leave my program destined for success in any community knowing they learned what it takes to work hard and get rewarded properly. I want the kids in my program to learn to be good leaders, hard-workers, and how to be responsible through prioritizing life the right way. NATHANIEL: I am very excited about the growth my program has undergone while I have been here. This year’s seventh-graders (when middle school starts here) are the first class that I started as fifth-graders. Related to that, my middle school band went from 18 last year to 27 this year (which is about half of the middle school). I do expect some attrition, but those increased numbers have the potential to do really great things down the line. In terms of what I have been trying to do, I have been making a very concerted effort to increase the diversity of composers whose music we perform. It is really common to go to a band concert and hear exclusively pieces written by white men. With more than half of my students being girls, I feel it’s very important for me to show them that women have a place in music and that it is something they can pursue. When I got here, the only woman represented in the band music library was Anne McGinty, who had about three pieces here. Pushing myself to give each ensemble at least one piece by a woman every concert has forced me out of my comfort zone in terms of repertoire and led me to learn about some of my new favorite pieces of music, as well as helping to break down my students’ outdated ideas of who composers are. ZACHARY: At this point, I am trying to develop a greater emphasis on music literacy and sight reading in all of my choirs. Even starting from the basics, if students can read what they’re supposed to perform, they’ll probably learn it more quickly and do better in performance. As I put this article together it is hunting season in Wisconsin. These three “young bucks” are working hard to keep music alive in our schools on the shore of Lake Superior. I believe many young teachers are going through some of the same experiences. Thank you Brett, Nathaniel and Zachary for sharing your thoughts with us!